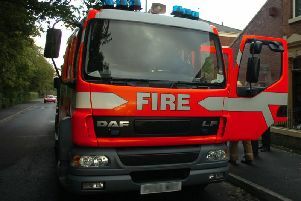 Fire service at the fire on a St Nics rooftop in Lancaster. Three boys are helping police with their enquiries following a fire at St Nicholas Arcades in Lancaster. Detectives investigating the fire released a CCTV image of three boys they wished to speak to. The boys have now been identified and are assisting the police. The fire started at around 8.40pm on Wednesday June 1 in the vicinity of the Poundland and Superdrug stores and is thought to have caused around £10,000 to £15,000 worth of damage to the building. Enquiries are ongoing to establish the circumstances surrounding the fire and officers are working closely alongside Lancashire Fire and Rescue Service. It is being treated as suspicious at this time.